This is a collection of my owl family appliques. There are 5 patterns to choose from. 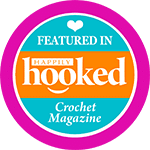 All of the patterns can be created using any weight yarn, embroidery thread or crochet thread to create adorable pins, hair accessories or appliques. I have written each pattern with the yarn and hook size I used to achieve that look. 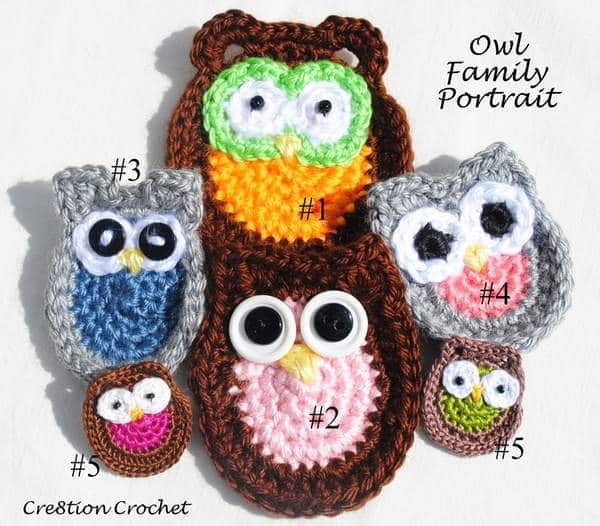 The eyes for owls #2-4 are interchangeable and the eyes used on owl #1 can also be used on owl #2, so you can have lots of fun mixing and matching to come up with a variety of different designs. Please note that all of the following patterns are written in the same way. There are no starting chains to begin a round. All rounds are done in sc, and the last sc is simply slip stitched into the first sc of each round. 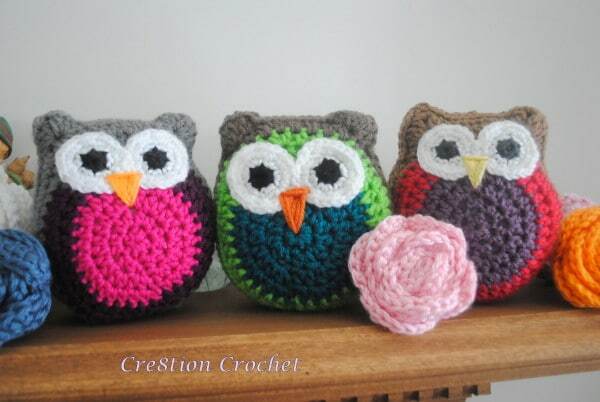 Even though I have chosen to use Caron’s Simply Soft yarn for all of the owl patterns, with the exception of owl #5, which I have done in embroidery thread and turned into an adorable pin, you can use any yarn of choice. I do recommend using a smaller hook than what the yarn calls for, to obtain a tight crochet. 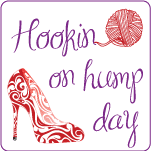 I would use a 4.00mm-4.50mm with any worsted weight yarn and a hook approximately 1 to 1.5 sizes smaller than the yarn you are using calls for . Different yarn weights will give you different finished dimensions. I hope you enjoy my Owl Family Portrait patterns. 1. Using center owl color, leaving a 6-8” tail to begin. mc/r with 6sc. sl st into 1st sc to join round. 7. 1sl st into each of the next 2sts. 6sc into the ch3 sp. 1sl st into each of the next 6sts. 6sc into the ch3 sp. 1sl st into each of the remaining sts. sl st into 1st sl st to join round. Fasten off and leave 6-8” long tail. Use long center tail and long end tail to secure onto finished work. 7. 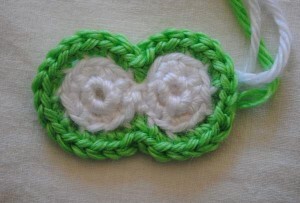 Change hook to 2.75mm and pick up eye border color (green). In back loops only, 2sc in every st around, sc2tog in center/indents. 8. 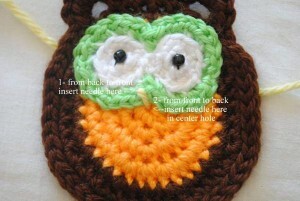 Sew buttons, beads or sequins into center of eyes and stitch onto applique, above the center (hole) in owl body and right at where center color (orange) meets outer color (brown). 1. Using yellow or orange yarn approx. 12” long, thread (one strand) embroidery needle. Insert needle (from back to front) at right lower “corner” of the left eye. And insert (from front to back) into the center/hole. 2. Insert needle (from back to front) at left lower “corner” of right eye. And insert (from front to back) into the center/hole. 3. Insert needle (from back to front) into the beginning space (right lower corner of left eye) and insert (from front to back) into the space directly across (left lower corner of right eye). 4. Continue to insert needle (from back to front) into the center/hole to each corner above to fill in the entire beak space. 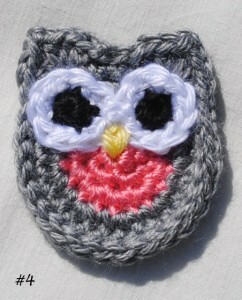 This completes your first owl. 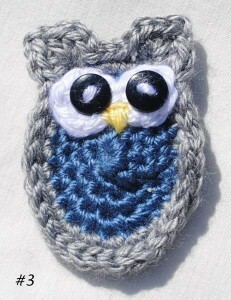 Alternately you can use any of the eyes from patterns #2-4 on this owl as well. (If you use buttons for complete eyes, stitch beak on first at approximately the same areas). 1. Using center owl color, leaving a 6-8” tail to begin. mc/r with 5sc. sl st into 1st sc to join round. 1. Stitch two white buttons with smaller black buttons in center into place. *stich beak on first using the same method described in Owl #1 (same general placement). Alternately you can use any of the other eyes from Owl #1, 3 or 4. 1. Using white. Leave 4-6” long tail. mc/r with 8sc. sl st into 1st sc to join round. Fasten off and leave 6-8” tail, secure to back of eye, tighten center tail and tie both tails together. Cut center tail short and leave long tail to weave eyes onto owl. 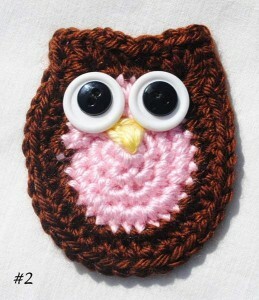 Alternately you can use the eyes from owl #2 or owl #4 instead. 1. 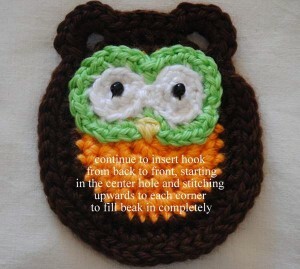 Stitch beak on using the method in Owl #1. 1. Starting with black, leaving a 4-6”long tail. mc/r with 5sc. sl st into 1st sc to join round and change to white. Tie short tails of white and black together to secure. 2. 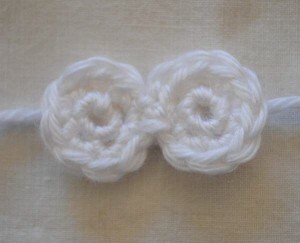 Using the white yarn, 2sc in every st around. <10>. Fasten off leaving 6-8” long tail. Pull center (black)tail tight and tie to other black tail to secure. Cut all tails (except the last long white tail) short. 4. 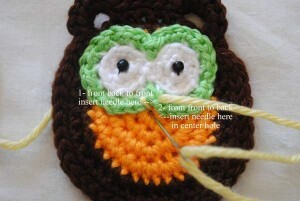 Stitch both eyes together at two st spaces and secure finished eyes onto owl, at the space where the inner and outer colors meet, above the center. 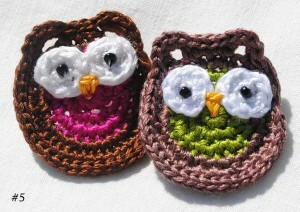 Alternately you can use the eyes from Owl #2 & 3 instead. 4. 1sc in each of the next 10sts. 7. Fasten off and weave in tail to where the tied inner and outer tails are. Tie all three tails together (leaving center tail) and cut short. 6. 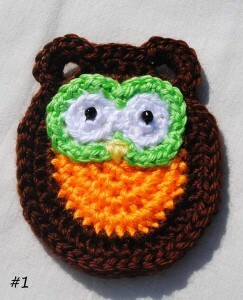 Stitch eyes onto owl where outer and inner colors meet, above center/hole. 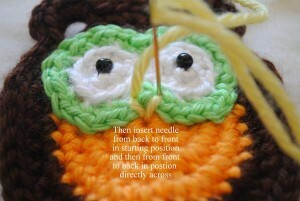 Stitch beak on using the method described in Owl #1. Fasten pin to center back and stitch on using long center tail, or stitch onto a hair barrette or clip. 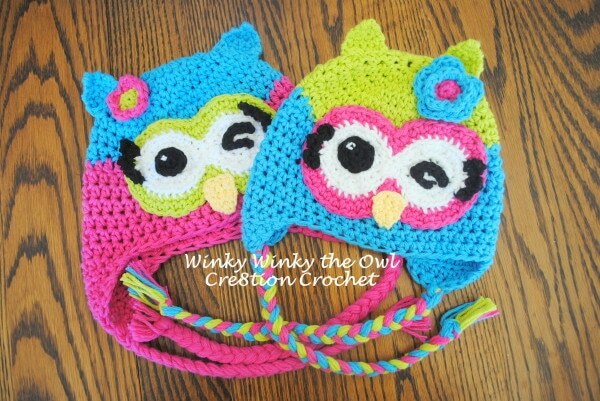 This is completes all of the owl patterns! 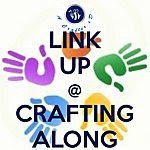 If you have any questions please feel free to comment on my bellow, or to email me at cre8tion@ymail.com. 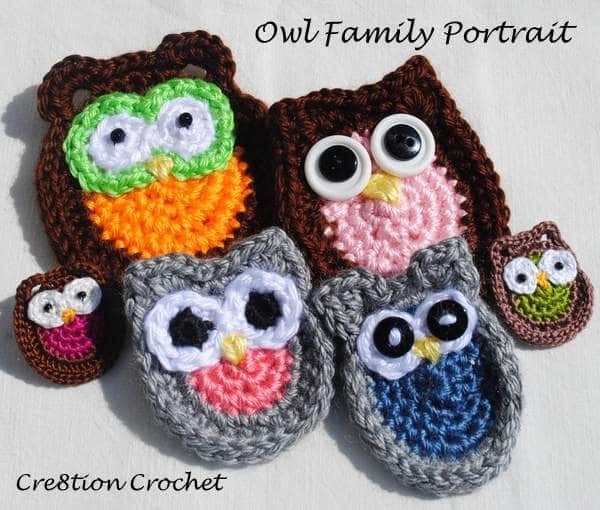 I hope you have enjoyed making the Owl Family Portrait patterns. Like It? Love It? Share It!!! 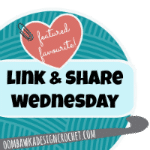 Your continued support allows me to bring you more free crochet patterns.